See also Serif by WitherClubtw, CB Serif by CB Pachuau, XB/FS Tricoto Ext. by anonymous-1466233. Info: Created on 2nd December 2017 . Last edited on 3rd December 2017. I made something similar 4 years ago. It was way worse, though. You definitely have a recognizable style and a very professional-looking one to top that, but I don't have any recognizable style, so you're not the only one to think that. This font takes my breath away. I almost never rate 10/10. This is. I especially like the serifs on the C and the S. Do you mind if I clone it and play with it? Congratulations! FontStruct Staff have deemed your FontStruction worthy of special mention. 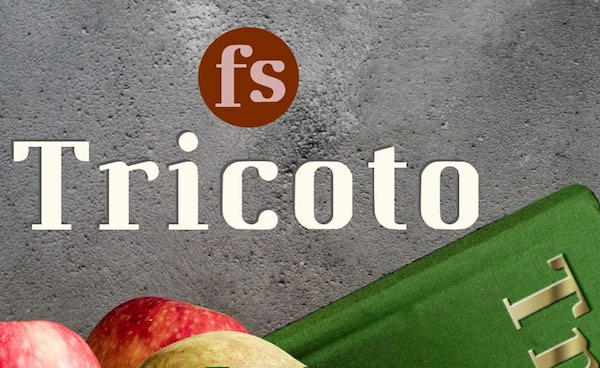 “fs tricoto” is now a Top Pick. Thanks, meek, and thanks, Aeolien! Hi, ETHproductions. I' m working on a remix of your font. May I use that remix in my school report? P.s. I need the answer before 8/20. Thanks. Here is my final project. Still thank for the original font. And sorry for didn't see yor CC License. I love this font. Has an elegance but the rounded serifs keep it fun. Did this mockup to try it out in a few ways.